The hosts are winless in the last 3 matches across all venues including two consecutive losses. In the last 6 games from all competitions, they have lost 3 and won 2 matches. Over 2.5 goals were scored in 8 of their last 10 matches. A 5 game win streak at home in the league is going on. But they lost the last game played there against Vitesse, which was a cup match. Over 2.5 goals came in 5 of the last 6 home matches for Heracles. With this recent show, they are 4th in the league, in which they finished 10th last season. They have won 6 of their 11 matches and scored a handsome 25 goals too. Even at this stage conceding 22 goals gives the manager something to worry about. The visitors are equal on points with the hosts but are 3rd on goal difference. They too have scored 20 goals but are disciplined at the back compared to their opponents for Sunday, conceding just 13 goals. In the last 8 matches they played in all competitions they have lost only 1 match, which was in the league against the mighty Ajax. In 4 of their previous 5 matches, the final score had a total of over 2.5 goals. But away record is not so good for them. In the last 6 matches on the road, they have 2 wins and losses each. With a game in hand, Feyenoord has a chance to stay where they are right now with a win or draw in the game. But they will look for a win considering the home side’s poor defensive record. Feyenoord is unbeaten in 7 h2h matches, of which they have won 6. A total score of 2.5 goals was scored in 5 of those matches. The side from Rotterdam has won the last 2 h2h at the home of Heracles. Over 2.5 goals came in 3 of the last 5 h2h matches at this venue. Feyenoord has never lost at this ground in 3 h2h matches and is on a 5 game winning streak against this opponents. Their loss was against Ajax who is a level above the rest of the teams. So we can say that the away side will have more chances to score and will be disciplined at the back. So we can say that Feyenoord will win this game on the back of their h2h statistics and bet on the same with 1.68 odd. Both the teams have scored over 20 goals this season from their 11 matches. 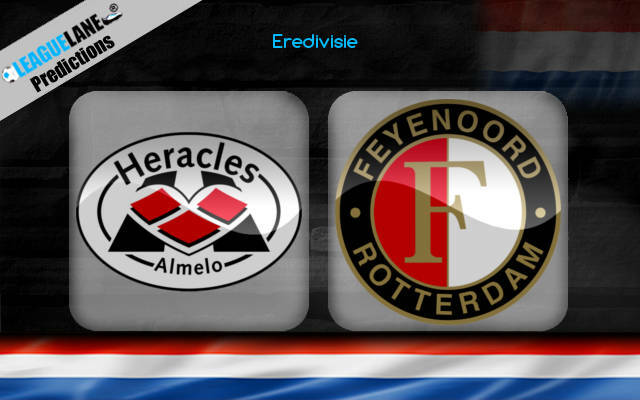 Out of the 11 matches that Heracles played the final score was more than 2.5 goals. The same trend is followed by Feyenoord in 6 of their matches. Also considering the poor defense of the home side we can expect many goals in this match. So we can bet on over 2.5 goals with 1.53 odd. Feyenoord to win @ 1.68 (2/3). Over 2.5 goals @ 1.53 (6/11).